Born is one of the four neighborhoods that compose the historic district of Barcelona. It’s located between the Via Laietana Avenue, Arc de Triomf, Urquinaona square and Barceloneta, the coastal neighborhood. Despite its humble beginnings as a settlement built on a medieval fair, Born has grown into one of the trendiest places in town. Its narrow streets host all kind of chic stores where people go looking for unique items. Born can also offer many cultural activities as the Picasso Museum or Textile Museum are located right there. During the day the cafes are packed and at night people enjoy the several bars and clubs that this neighborhood offers to the nightlife lovers. No matter if you fancy a live jazz show, a nice mojito seating on a terrace or dancing some Rock and Roll on a club, Born will definitely meet you nocturnal expectations. This new club is not just a restaurant, neither just a bar, is a multidisciplinary space where music, art, cuisine and cocktails coexist creating a unique place to spend a good time. The particularity of Guzzo is that, besides being a cozy restaurant that turns into a club by night it’s also a place for hearing live music. There are Jazz concerts every week that will keep you entertained while you eat something or have a drink. Another good reason for visiting Guzzo is its cocktail menu ¡Have a try! This club is always packed and that’s easy to understand. With an eclectic mix of funk, retro-pop and rock it’s a good place to party for almost any kind of people. This club was inaugurated on the 70s and it has turned into one of the biggest rock icons in the city. Actually they also host live rock concerts. It’s located right next to Mercat del Born and it opens from Thursday to Saturdays until 6am for a relatively cheap entrance. Definitely a must go for every Rock and Roll lover. In case you want to try something more local and traditional you should visit El Xampanyet. This is an authentic Catalan cava bar that sells local products with reasonable prices. Drinks are served on low cups and their tapas are one of the tastiest ones in town. Moreover, you can also purchase homemade products to take to your home. 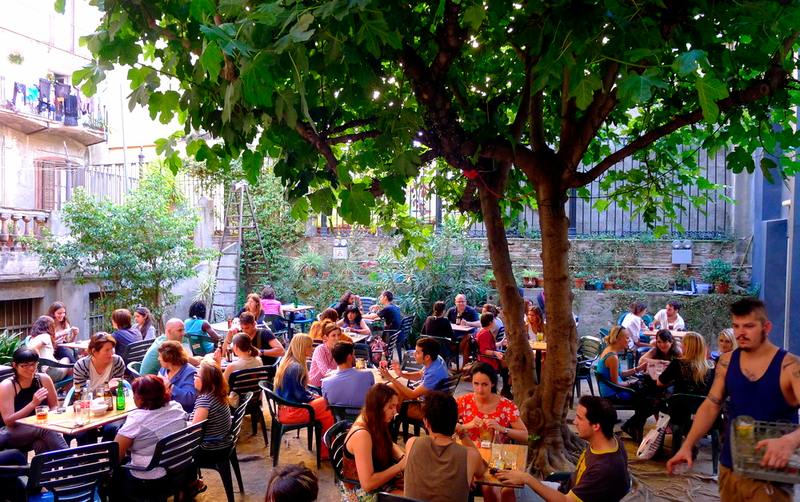 Definitely the perfect place if you want to breathe an authentic Catalan atmosphere. This bar has the look of an alternative cultural association, and actually that’s what it is. The Antic Teatre is an old recycled space with a theatre room where they schedule theater plays and other kind of shows. It also has a bar and it’s mainly known for having one of the best and biggest interior terrace in Barcelona. A giant patio with some vegetation, ideal for drinking beers before entering to one of the many cultural activities they organize. La Luna is a sophisticated bar located next to the Plaça de Santa Maria. Its interior is thoughtfully decorated to offer the best possible atmosphere to the customers. In addition to the exquisite food served they also offer an endless list of cocktails that you should definitely try. This is our choice for the 5 best bars in Born ¿Do you know other great bars in this area? ¡Share your discoveries with us! Thank you Angela! You’re very kind. 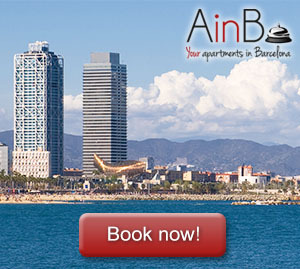 We will be happy to welcome you if you decide to rent an apartment in Barcelona. We will wait for you!